06Whether or not you believe in Darwin’s theory of biological evolution, there is no denying that evolving your character into something fiercer with additional traits is a feature heavily embedded in many video games. 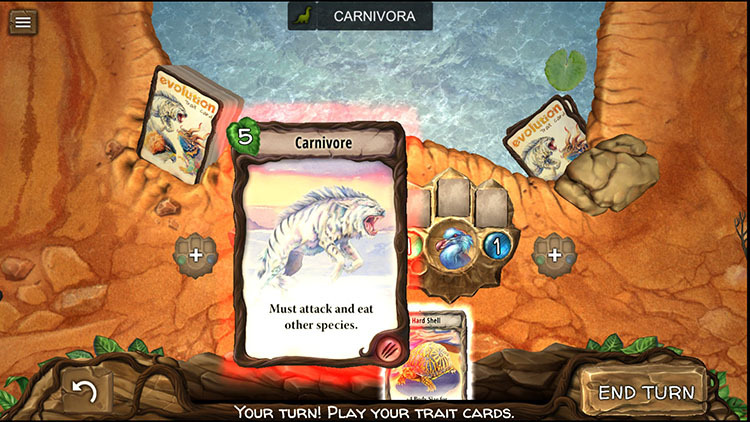 In Evolution: The Video Game, based on the boardgame Evolution, you need to adapt before you go extinct, and thus evolution begins. Whilst the game comes with a full-fledged campaign mode, there isn’t much of a storyline to it. The campaign mostly acts as a tutorial, guided by a Professor who is teaching you the ropes of the rules and strategies of the somewhat complicated mechanics. Visually the game reminds us of a tabletop board game, with plenty of browns and greens to create a feeling of standing between the various species of wildlife. Like Hearthstone, Evolution: The Video Game has few tricks up its sleeve regarding animations of the surrounding areas and the creatures themselves such as carnivores attacking one another with their sharp claws, leaving claw marks in their wake. It all creates an immerse gameplay experience that a board game or card game cannot convey. Undisturbed jungle life can be quite calming and the ambiance sound in this game is very relaxing with birds singing softly in the background accompanied by rhythmic instrumental sounds. Of course, the game also comes with sound effects to increase the immersion, such as the rustling of leaves, the roars of carnivores, the shuffling of cards and coins going into a coin purse. 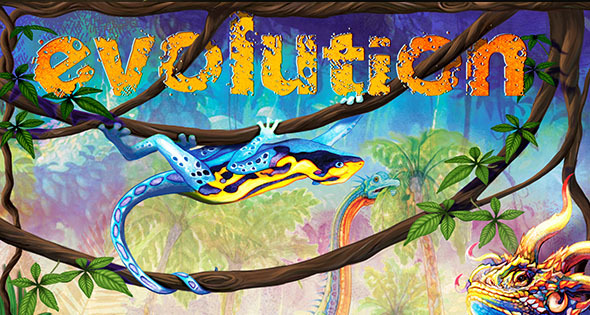 Evolution: The Video Game is the boardgame Evolution brought to life, so if you have played the board game before, you’ll know everything there is to the game. Unlike many other boardgames or card games, it doesn’t want you to be the last surviving species. In fact, you’ll start out with one species already on the “board”. Each round, you’ll receive cards dependent on the number of surviving species. Before we dive deeper into the mechanics, it should be known that one species can have a maximum population and body size of six. 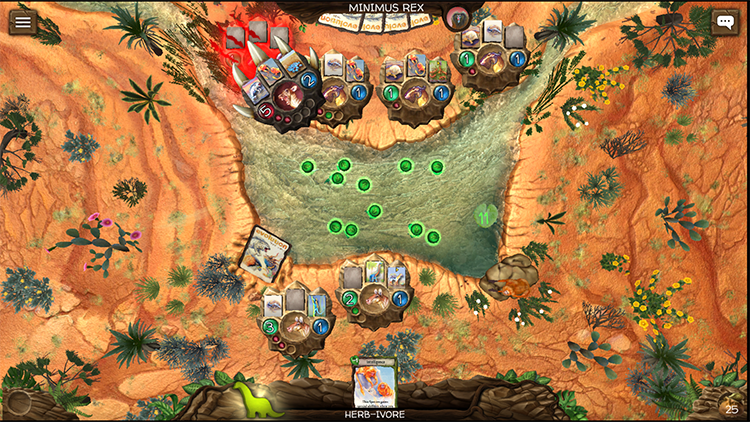 Before being able to play your cards, each player must first add a card to the watering hole, which is basically where the food is being stored for the herbivores, the first species. Each population per species, or pack, can eat once. 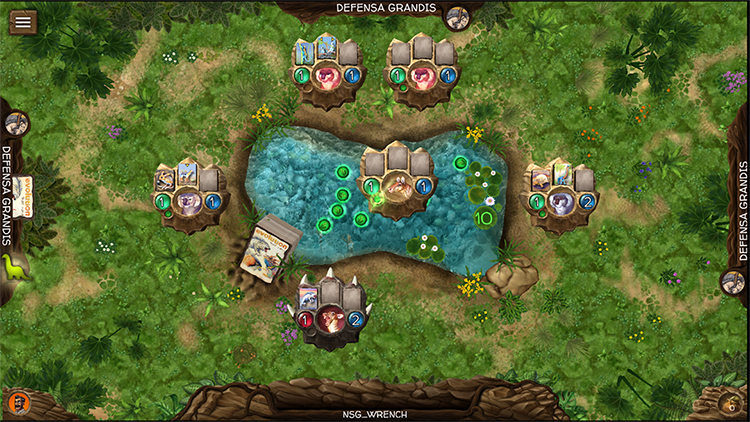 Adding food to the watering hole is done by sacrificing one card per player, each card has a food number on the top left corner. Surprisingly this number can range from minus seven to plus eight. The fact that you don’t know what your opponents will be playing ensures that you need some luck on your side as well as careful planning. We’ve already established that herbivores need to eat plants, which is found in the watering hole. However, each species can have up to three species traits which means that you can evolve your species to carnivores. There are quite some traits to be unlocked, and several of these will be unlocked as you go through the campaign. Certain traits are a way to evolve your species into something your opponent cannot touch, such as adding a Hard Shell to ensure that the opponents’ carnivore cannot attack you. Other traits are simply a means to an end, a threat of some sort, such as Horns which is not deadly for a carnivore, but the carnivore will lose one population if it does attack. A few helpful traits, especially at first, are the Long Neck (receive 1 plant food for free before feeding begins) and Cooperation (every feeding, share 1 food to the right). With so many traits to be unlocked, the game has a steep learning curve, but it tries to ease you into the difficult matters of things. After each round, the fed population and meat points will go into a coin purse. Once the last round has been played, the total amount of traits your species has, and the total amount of population points will be added to the coin purse. The player with the most points wins the game. Additionally, the game can be played in offline and online modes. The offline, or local modes, are the campaign mode and AI mode whilst the online modes give you the option to find a match online or create a private game. Playing the campaign mode can be daunting at first, especially when you are still learning the ropes of the mechanics, and it can be a tad annoying to replay the ten rounds per game three or four times but once you’re past the learning, it can be smooth sailing. Evolution: The Video Game is an excellent rendition of a board game with plenty of traits to ensure that each gameplay is never the same. With four different modes to venture in, with the campaign mode acting as a guided tutorial, there’s plenty of things to do. Regardless, after several games, the game can feel a bit repetitive if your heart is not truly in the game, which is why this game is a hit or a miss depending on personal tastes.